I believe in moral victories. This wasn’t one. But Navy’s season is far from ruined after a 17-14 loss to Maryland on Monday at M&T Bank Stadium in Baltimore. The unbeaten season nonsense, the Dobbs for Heisman impossible dream — all of that is dead now. But nothing that happened today leads me to believe that Navy can’t still end up with 9-10 wins and a bowl berth. Between an inept start on defense, a missed field goal and four red zone drives that ended in zero points, the Mids did about all they could to lose this game. But in the final minute of the fourth quarter, they were a yard away from winning it. How did that happen? Here’s how: The Navy option attack, led by quarterback Ricky Dobbs, racked up more than 400 yards rushing against a BCS-conference school. 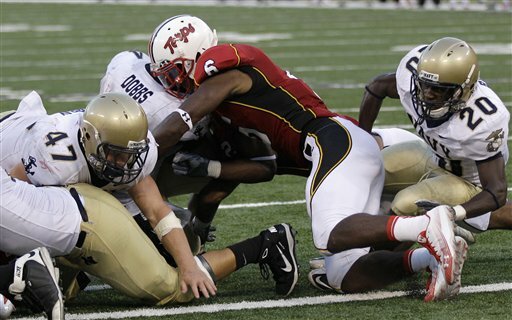 Navy’s defense, battered by Maryland’s running game in the first quarter, forced two timely turnovers of their own and tightened up enough to not allow a touchdown after the first quarter. The Mids offense dominated the time of possession, and their defense managed to force more punts than the Terps did. Dobbs, despite two disastrous turnovers inside the Maryland 5-yard line and the costly decision not throw the ball away at the end of the first half, still ran the option to perfection for much of the game. He came up short on fourth and goal on the Mids’ final play, but like coach Ken Niumatalolo, I’d put my faith in Dobbs in that situation against any team, any time. Don’t let Maryland’s 2-10 record in 2009 fool you. They are a bigger and more talented squad than Navy. That doesn’t mean they’re better — luck turned out to be their biggest asset this afternoon — but seeing Navy lose to the Terps shouldn’t trigger panic. With its always small defense (manned this year by a set of inexperienced linebackers), Navy will struggle against teams who run the ball effectively. Offensively, with Dobbs, fullbacks Vince Murray and Alexander Teich, and Greene and Byrd picking up the slack left by Curry’s departure, Navy will give every single defense on their schedule fits. So in essence, it’s the same old Navy we’ve seen for the past 6-7 years. That’s a great thing for level-headed Navy fans, and bad news for Army and Air Force.